Small binding energy shifts of some compounds compared to indium metal. Collect principal In MNN peak as well as In3d. Bigger chemical shifts observed for In MNN compared to In3d. In3d region has well separated spin-orbit components (Δmetal=7.6eV). Loss features are observed to higher binding energy side of 3d3/2 spin-orbit component for In metal. 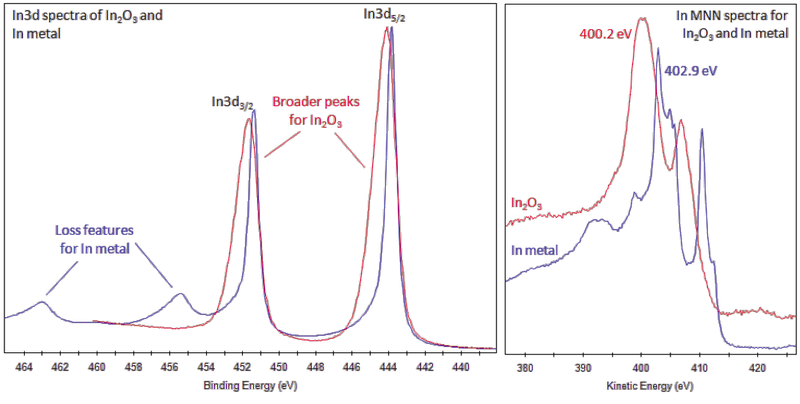 In3d peaks may also show asymmetry for indium oxide, if other compounds are present (e.g. hydroxide) or there are vacancies/defects in the oxide lattice. Small or negligible binding energy shifts for compounds, such as oxides. In3d peaks broaden with respect to metal peaks for compounds. Use X-ray induced In MNN Auger peaks to aid chemical state assignment. 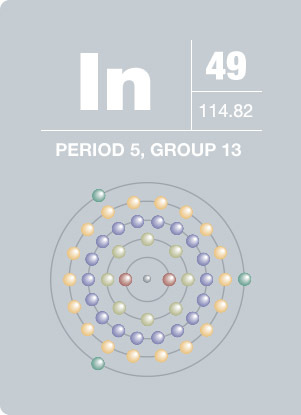 Most elements were discovered while scientists searched for other materials, and indium is no exception. This very soft, silvery-white metal has a bright luster and emits a high-pitched “cry” when bent. One of the first major applications for indium was as a coating for bearings on high-performance aircraft during World War II. Later, tin-doped indium oxide, transparent and colorless in thin films, became a main component in liquid crystal, flat panel and plasma displays. Not surprisingly the demand for indium has risen dramatically, and lower cost alternatives such as carbon nanotubes and conducting polymers are being studied.